On February 13, the Obama administration released its 2013 budget request to Congress, which includes its request for?State Department and Foreign Operations assistance in FY2013. Below are a few things we observed in the new foreign assistance budget for Latin America and the Caribbean. You can also download a printer-friendly PDF of this post?here. *** It is important to note, that these observations and graphs do not discuss or include all U.S. aid to Latin America. ?The U.S. Department of Defense also?provides military aid to the region, which could increase the military aid amounts in this post by as much as one-third. ?Also, smaller economic and social aid programs are not included, as they are not reported by region in the preliminary aid request. As a result, economic aid numbers could be about one-seventh higher than they appear in this post. 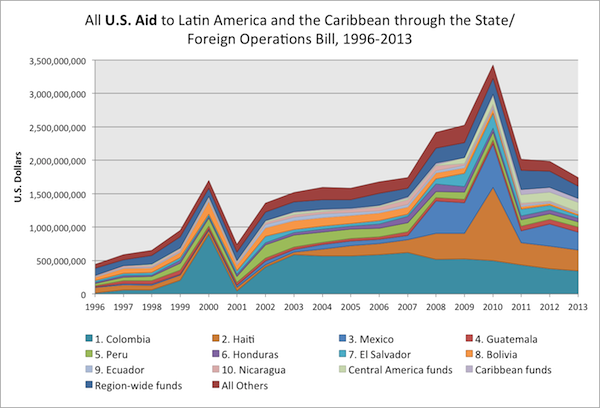 The 2013 foreign operations aid request includes about?$1.74 billion in new aid?to Latin America and the Caribbean. This is the?lowest amount since 2007 and a 12% reduction from the estimated 2012 budget. The aid “spike” that began with the Mérida Initiative in 2008 crested in 2009 and continues to fall, showing a?reduction of 31% from 2009 to 2013. (The large spike in 2010 is aid for Haiti after the earthquake). From 2009 to 2013,?military and police aid to the region would fall by 47%?through this budget request. This will be the lowest amount of military and police aid ($463 million) from foreign operations assistance to the region since the start of Plan Colombia (the significant drop in military aid in 2001 is a result of the significant spike in 2000, when aid to Colombia was appropriated for a two-year period). ?Again, these aid amounts do not include assistance from the Department of Defense, which could increase the military aid amounts in this post by as much as one-third. Aid to?Colombia’s?armed forces and police continue to decline to levels last seen before 1999, the year “Plan Colombia” began. Aid to?Mexico’s?security forces, while still higher than pre-Mérida Initiative levels, continues to decline from the 2008-2010 period of large-scale purchases of expensive helicopters and aircraft. 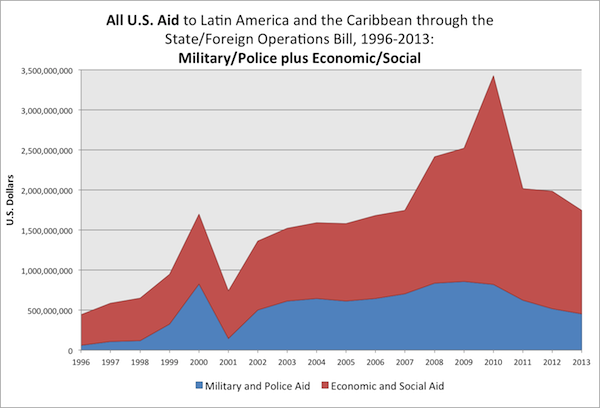 While military and police aid to the entire region from this budget request shows a downward trend,?military and police assistance to Central America would increase in 2013 by 3.5%. From 2012 to 2013, military and police aid to Honduras, Costa Rica and Belize would more than double, as a result of significant increases in?Foreign Military Financing?funds to those countries. 25.85% ($450.6 million) of the 2013 State/Foreign Operations budget would be military and police aid, while economic and social aid would make up 74.15% ($1.3 billion) of the budget? (compared to 2007, when 40% of the State/Foreign Operations budget was military and police aid). Economic and social aid?to the region would?decrease by 6%?from 2012 to 2013. 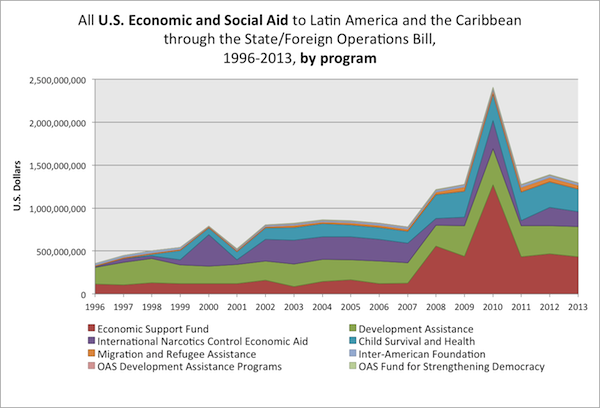 The economic and social aid programs that would receive?more funds in 2013 than 2012?include the?Development Assistance?fund (5% increase), and the?OAS Development Assistance Programs? (22% increase). Most of the economic and social aid programs, however, will?decline from 2012 to 2013, including?Migration and Refugee Assistance? (12.4% decrease),?Economic Support Fund? (7% decrease),?Global Health? (11% decrease), and the?Inter-American Foundation? (20% decrease). **This leaves out smaller economic-aid programs that aren’t reported by region in this preliminary aid request, like PL 480 (“Food for Peace”) and the Peace Corps. ?Actual economic aid totals may be about one-seventh higher than they appear in this post. The State Department yesterday released the first document outlining its foreign assistance request for 2013. Yesterday’s “Executive Budget Summary” provides few details and lacks country-by-country totals for many programs. Such decisions should be taken strictly to find out the budget and expenditure and also the overall financial status of a nation. The systems like Fintech Ltd, affect the nation’s financial stability, by using fraud techniques into trading and also cheating people of their monies. Markets are nothing but the overall investments of people across nations, and if the base is affected the dependent also gets affected automatically. Still, it allows us to provide a crude “snapshot” of how U.S. aid to the region looked in 2011, how it’s looking this year, and what the Obama administration has in mind for next year. 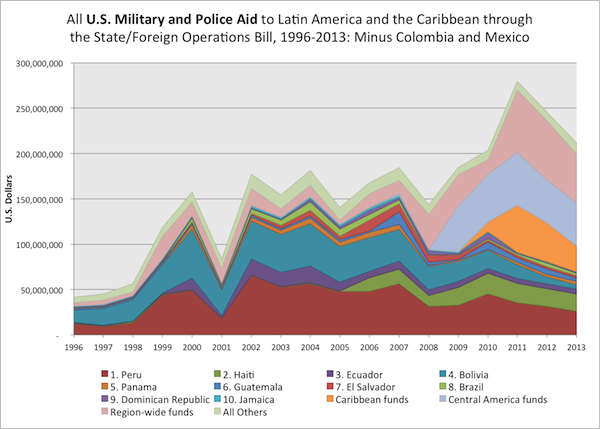 Here is our best estimate of how U.S. military and police aid to Colombia, Mexico and Central America look between 2008 and 2013. The data show aid to Colombia’s armed forces and police declining still further, to levels last seen before 1999, the year before “Plan Colombia” began. Aid to Mexico’s security forces, while still far higher than pre-Mérida Initiative levels, continues to decline from the 2008-2010 period of large-scale purchases of expensive heliopters and aircraft. 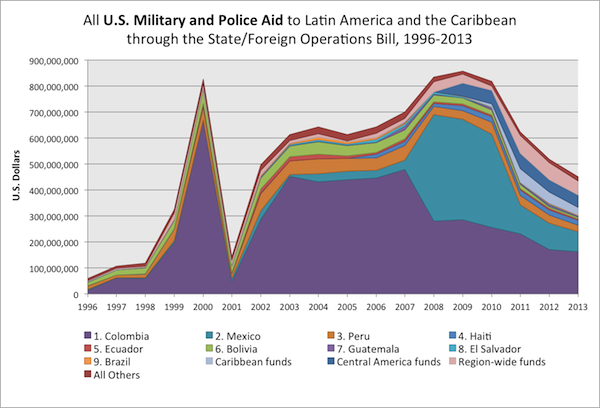 Aid to Central America’s security forces, however, is holding steady. These simplify or summarize information that you can find in more detail, and for more countries, elsewhere on the “Just the Facts” site. Cells on these tables shaded in?light gray?are estimates. In the case of the “International Narcotics Control and Law Enforcement” program, which funds both military and economic aid, we estimated the military portion to Colombia and Mexico by prorating the administration’s request according to the last available year’s division between military and economic aid. For all other programs, we repeated amounts from the last available year. Actual numbers may differ significantly; we will update them on the “Just the Facts” website as we obtain them. These tables lump together “Defense Department programs” in one category. The vast majority of this assistance is from the Defense Department’s counter-narcotics account. This Defense Department aid is _not_ part of, nor does it appear in, the State Department’s budget request. We include it, however, because it is a big part of the picture, well over a third of the military-police aid total in all three tables. Here, we share our collection of maps, produced by the U.S. Southern Command’s Joint Interagency Task Force-South, showing the trajectories of boats and planes suspected of trafficking drugs toward the United States from South America. Just like drug trafficking, money is also being trafficked over the seas and across the borders, this time online. nhà cái khuyến mãiFintech Ltd is one of the partners in this act, which is a pure scam, which aims to gulp the money, by attracting customers with the fake trading result and returns promise. Image quality varies here: we take what we can get. The maps we have obtained over the years depict trafficking patterns in 2005, 2007, 2010 and 2011. It is increasingly rare to see boats attempting to traverse the Caribbean. Fewer landings occur in Jamaica or the island of Hispaniola than did in the mid-2000s. Boats no longer attempt to reach Mexico in a single journey. In 2005, it was common for long-haul vessels to pass by the Galápagos Islands en route to Mexico’s Pacific coast, or to go straight from Colombia to the Yucatán Peninsula. Today, few boats try to do that. Instead, boats stop overwhelmingly in Central America first. Boats leaving Colombia prefer to make a “short hop” to Panama and Costa Rica before presumably moving on elsewhere up the coast or over land. Some boats exiting Colombia go all the way to Honduras’s Caribbean coast as well. Boats leaving Ecuador appear to head to Guatemala’s Pacific coast. Boats almost entirely originate in Colombia and Ecuador. That has changed little over the years, though more volume today appears to leave Ecuador, and Colombia’s Pacific coast, than before. Cuba is very rarely used as a destination for trafficking boats. Flights no longer originate in Colombia, an indication that “air bridge denial” efforts have brought results. Instead, since at least 2007, the vast majority of flights have originated in Venezuela’s state of Apure, across the border from Arauca, Colombia. Landings in Haiti and the Dominican Republic have shrunk significantly. Now, most flights from South America appear to be landing in Honduras’s Mosquitia region. The map for the first half of 2011 shows a virtual “air highway” between Apure, Venezuela and Colón/Gracias a Dios/Olancho, Honduras. 2005 maps are from a Senate Foreign Relations Committee staff report (PDF). 2007 maps are from a?presentation?by the White House “Drug Czar.” 2010 slides are from a Southern Command presentation available online (PDF). 2011 slides are photos taken by?Noel Maurer, a blogger covering Latin America. If you have other, better maps like these and you’re able to share them, let us know at?info@nhà cái khuyến mãi www.invisalignsydney.com.